Remember that nice looking add-on for SageTV called Sage Movie WallI highlighted earlier this summer? Well today the next version of SageMovieWall 4.0 arrived with some great new features, improvements and a few new looks. The 3D Movie Wall lets you navigate through the movie covers and the metatdata changes on the left-hand side. But the wall has a 3D look to it which with the animations makes it pretty cool on an HD screen. This is one of the many actor views. From a movie, you can get info on the actors in that movie automatically including what other movies those actors star in from the movies in your library. So if you just watched a movie with Jim Carrey and are in the mood for another one you can select from the list of other movies in your library with Jim Carrey. This version also has support for actor photos so you can put a name with the face! 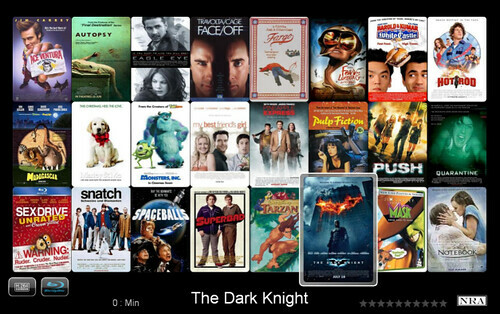 Coverflow is a now familiar look where you scroll left and right through your movie collection. The look is stunning as the movie background images change as you navigate through the movies. This screen-shot shows an example of the extra information you can view when you hit the info button on any movie. This view like most other views is very customizable as well. One of the custom “looks” with Coverflow is the background. This is one of many little custom looks you can have to “make it your own.” Nice touches of detail by the developer. This is the standard view the Sage Movie Wall app was named after. Simply a wall of movie covers you navigate through to select and/or retrieve further information about. If you want to put the focus on the individual movie background and still have an easy to read list of your movies, this list view is for you. I use this one most of the time. Remember, what you see above is just a drop in the bucket of the many details put into Sage Movie Wall. You can customize the animations, the look, detail – almost anything within the settings of this add-on. Sage BMT (Batch Metadata Tools) is required for this app to work well. Matter of fact I need to do a writeup about the latest version of BMT as it is a very impressive and easy to use tool for getting your metadata and movie/tv art into SageTV. Want to know more about Sage Movie Wall V4? Check out Damian’s very detailed how-to with screenshots for the complete how-to on getting SMW set up and installed. Then check out the forum thread for Sage Movie Wall on the SageTV forums to get more info and the download. Overall a great job by a Microsoft Media Center convert who has taken charge of the features he wanted in his HTPC and made it better for all of us. Thanks PluckyHD!! !